Arkansas Gov. 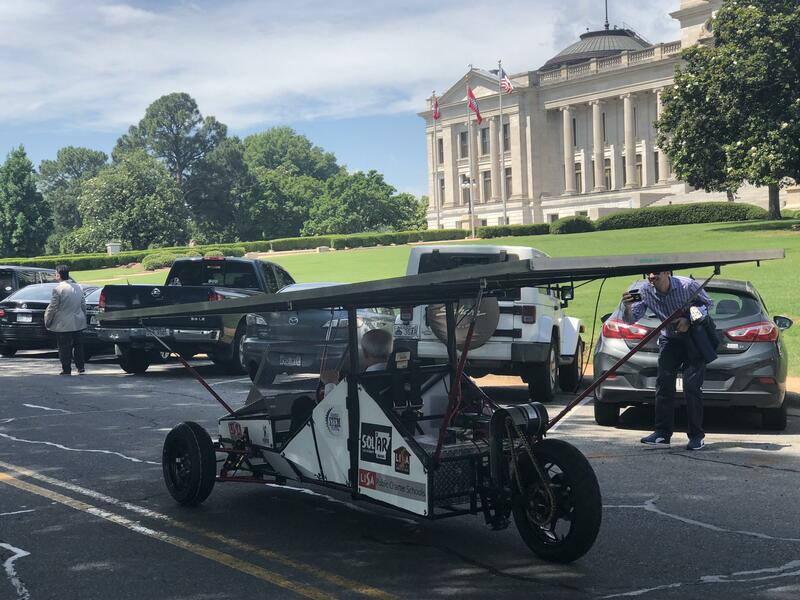 Asa Hutchinson takes the LISA Academy North solar car for a test drive in front of the Capitol. A group of 10 students from LISA Academy North charter school in North Little Rock are preparing for a journey of almost 1,500 miles in the solar powered car they built by hand. The group will travel with schools across the country from Fort Worth, Texas to Palmdale, Calif. in July as part of the Solar Car Challenge. LISA North is the first school in Arkansas to compete in the nationwide event. Jorge Galvan is a junior at the school and captain of the solar car team. He said the project evolved out of curiosity, and was well received by school staff. Gov. Hutchinson and student Jorge Galvan speak with a teammate on the steps of the Capitol in Little Rock. The group joined teachers and administrators in offering Gov. 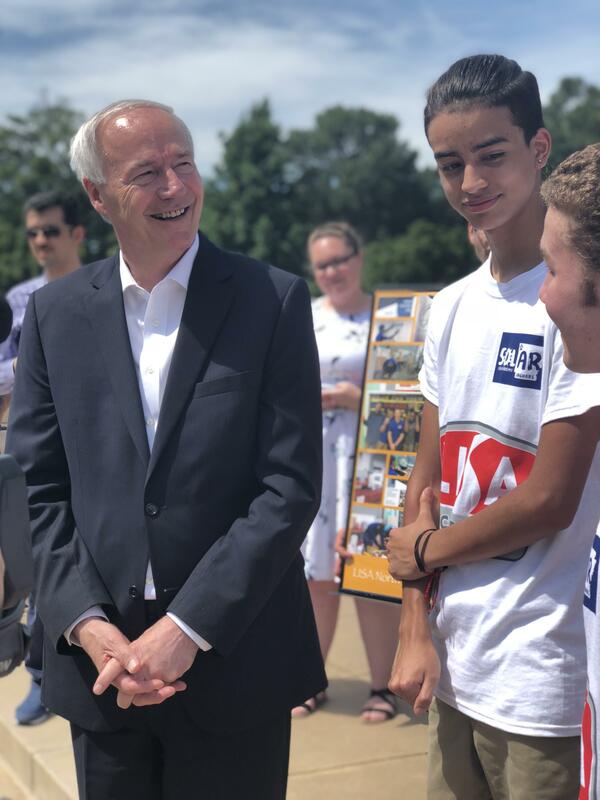 Asa Hutchinson a test drive at the Capitol Thursday, two days after Hutchinson oversaw the opening of the state’s largest solar power facility in Stuttgart. 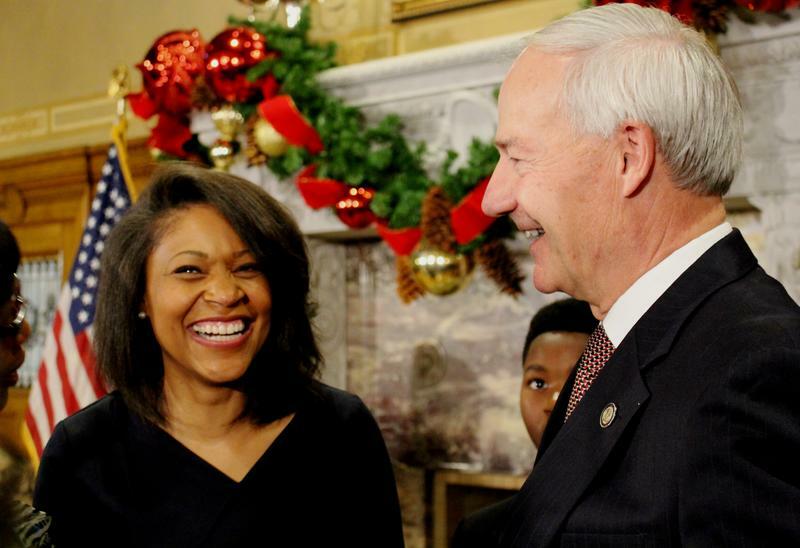 Hutchinson said he’s encouraged to see Arkansas’s renewable energy landscape making progress. Arkansas electricity prices rank 46th in the nation, which minimizes the cost-saving potential of generating personal solar power. Though a federal investment tax credit is available to help cover 30 percent of the cost of solar panel installation, Hutchinson said he doesn’t foresee any state credits or rebates to help pay for the cost of affixing solar panels on houses. Gov. 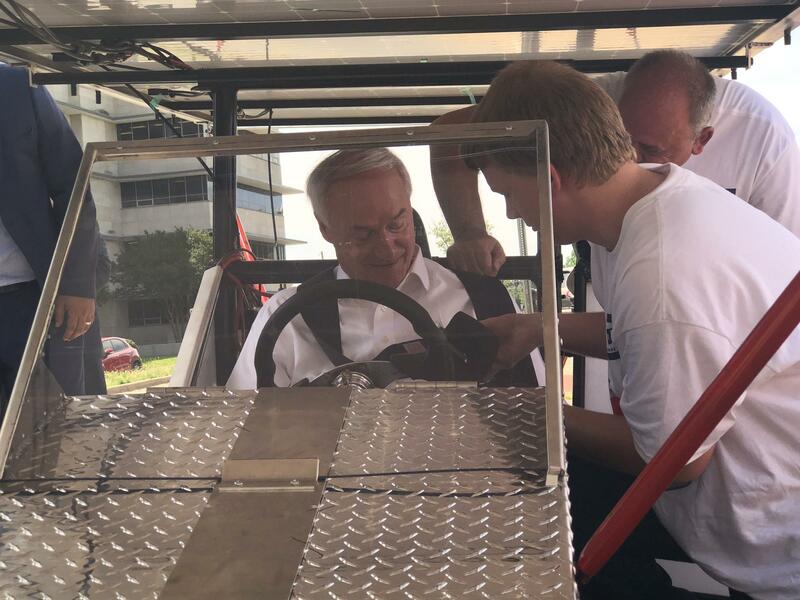 Asa Hutchinson gets strapped in before test driving the LISA solar powered car. Looking on as her students demonstrated their handiwork, LISA Assistant Superintendent Luanne Baroni said she’s grateful for Hutchinson’s support of alternate energy sources. Though she won’t be joining her teammates on the cross-country voyage, LISA North junior Ashanti Poindexter says she feels a sense of accomplishment after almost nine months of work. “I wanted to try something new, and doing this I figured would kind of help me get a feel for what area I would want to go into in the future,” Poindexter said. “I’m very happy and excited. I got to see nothing turn into something, and it’s pretty cool." 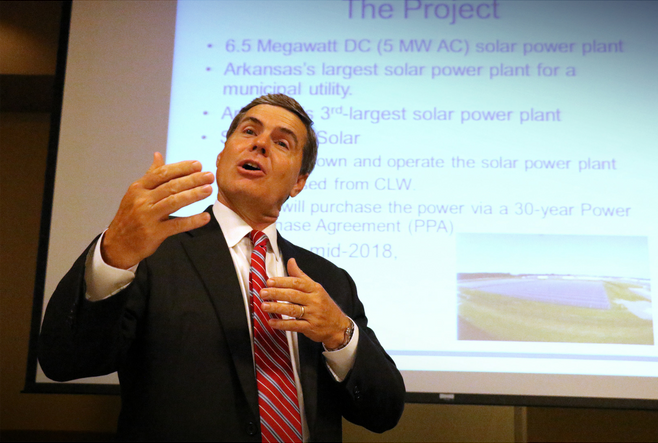 While the energy sector is bracing for higher prices under the impact of President Trump’s 30-percent tariff on solar goods manufactured outside the U.S. the city of Clarksville is ready to turn on Arkansas’s largest municipal solar array. The $10 million project was constructed by Arkansas-based Scenic Hill Solar. It’ll ceremonially open on Wednesday six months ahead of schedule. CEO Bill Halter says it was made mostly with imported parts out of necessity. He expects future arrays to be more costly with the imposition of tariffs. 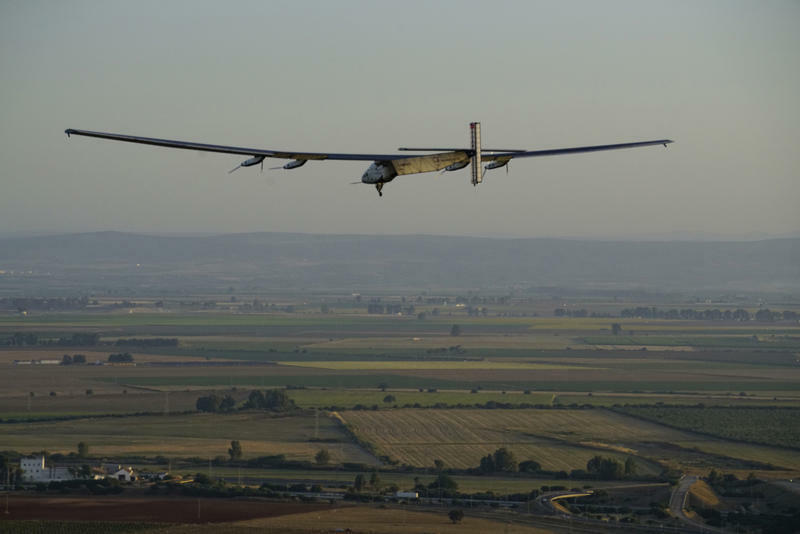 After 71 hours and 8 minutes of flight time crossing the Atlantic, Solar Impulse 2 has touched down in Seville, Spain. It's a major step toward the team's goal of circumnavigating the globe using only the sun's power. The end of this leg means they've now completed 90 percent of that journey. As The Two-Way has reported, the single-seater plane took off from New York's John F. Kennedy International Airport early Monday with pilot Bertrand Piccard at the controls. Governor Asa Hutchinson is calling on the state’s Public Service Commission and utility companies to “take the necessary steps to pass on the benefits” of Congress’s new corporate tax cut to Arkansas ratepayers. The Republican governor detailed his request to PSC Chairman Ted Thomas in a letter Thursday.